After returning from an overwhelmingly successful ISA Sign Expo in Las Vegas, Vantage LED released a new dynamic and mobile-friendly website showcasing their new FLEX Product Line and Business Terms along with upgrades to their true cloud-based LED software. 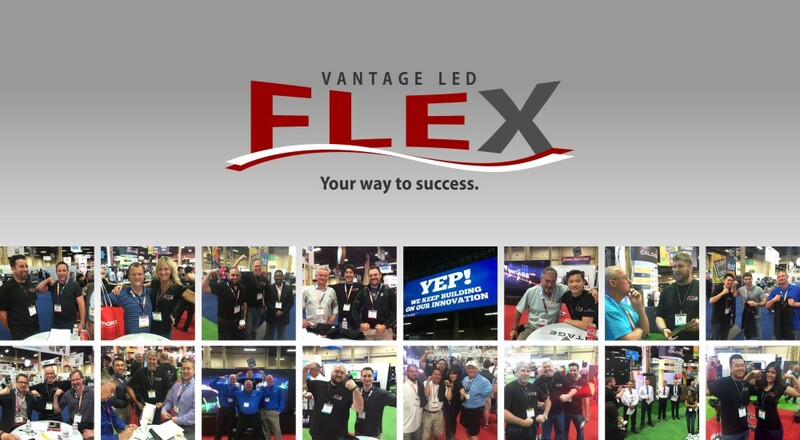 ONTARIO, CA--(Marketwired - June 16, 2015) - Backed by their campaign, ‘FLEX YOUR MUSCLE’, Vantage LED released several new innovations that caught the eyes and ears of the sign industry at the ISA Sign Expo in Las Vegas. They showcased a new outdoor and indoor FLEX product line, new flexible business terms, upgrades to their true cloud-based software, and a newly packaged live event software for live video & replay scoreboard displays. All of these great innovations can be discovered again on their new dynamic and mobile-friendly website. Navigation was kept simple to reflect Vantage LED’s approach to this industry. The new website features an old school side menu with a new school twist. Each menu item features a brilliant story-filled picture along with internal product pictures. A visitor can practically see everything available on the entire site within seconds of viewing before they begin their journey. The first of four statements on the ‘Power of Vantage’ webpage that truly defines what Vantage LED is all about starting with their core priorities in this industry: ‘Our People’, ‘Our Products’, and ‘Our Innovations’. The people behind Vantage LED are upfront, genuine, and eager to learn more about their dealer partners’ goals in this industry; going beyond product solutions to find mutual business incentives as presented with FLEX business terms. By providing a flexible warranty and onsite service up to 7 yrs, extended terms, low deposits, and guaranteed lead times, dealer partners gain more control over their time and cash flow to grow their business. The second statement rings true to their new mentality of “being flexible” starting with the innovative FLEX product line listed under ‘Our Products’. The FLEX line features a universal module for all their outdoor pitches from 24mm to an amazing 5mm. This gives sign owners the ability to benefit from a budget-conscious LED sign today, while having the flexibility to easily upgrade to a tighter pitch, or even from monochrome to full-color, as their business grows and their needs change. Vantage LED’s cloud-based software by SM Infinity is becoming increasingly more popular giving LED sign owners the freedom to control their advertising from anywhere from any internet-connected PC, Mac, mobile, or iPad. The biggest upgrade is the addition of animation modes to their online message editor; just some of the innovations as a result of Vantage LED communicating and listening to their dealer partners. From Vantage LED’s social platforms and gallery/press page to their client solutions and online university, dealer partners will find various forms of support. Vantage recently introduced the ‘Tradeshow Roadmap’. Vantage LED not only helps their dealer partners with costs, staffing, and equipment for trade shows, but they list their shows on their website as well as promote them through social networks and press releases to maximize exposure. The popular ‘Vantage University’ houses all the resources and collateral dealer partners need for product support, but Vantage LED takes it one step further by offering to co-brand their marketing materials with the dealer partner’s logo and contact info to support their brand. This final statement is the Vantage experience they want everyone to have from their dealer partners and clients to their teams and vendors; that everyone embodies and grows the company together. Vantage LED’s new website is more than just a place to see their products. It’s a start to build and support a lasting business relationship; to create a win-win-win situation between the manufacturer, the dealer partner, and the LED sign owner. Visit their website today at: www.vantageled.com. In a stagnant led sign industry, Vantage LED is forging ahead as an innovative led signs manufacturer in Ontario, California. Innovative Products. Real People. Smart Business. What's important to You? Let's Talk. We're here to grow your business. By being flexible, we can tailor our Terms, Deposits, Warranty, Onsite Service, and Lead Times. We're more than just a source for product. We're Listening. What's Important to You? 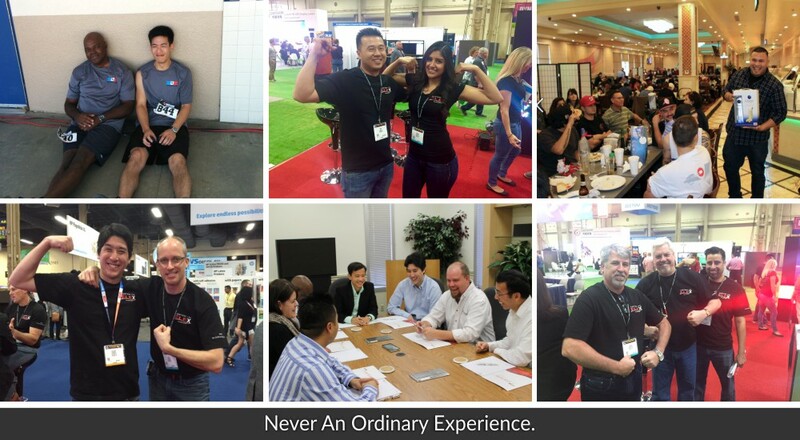 We love our tagline, "Never An Ordinary Experience." It constantly reminds us to cherish the great moments while we push this dynamic industry forward. FLEX YOUR MUSCLE: Vantage LED released several new innovations that caught the eyes and ears of the sign industry at the ISA Sign Expo in Las Vegas.